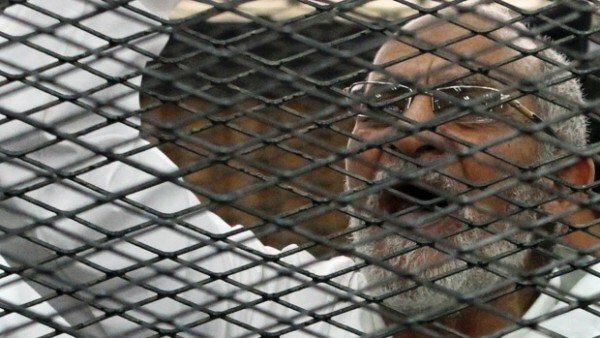 An Egyptian judge has confirmed the death sentences for the Supreme Guide of the Muslim Brotherhood Mohammed Badie and 13 others. They have been sentenced to death for planning attacks against the state. A US-Egyptian citizen and 36 others have been jailed for life. Mohammed Badie was sentenced in March and is embroiled in some 40 other trials. The sentences are subject to appeal. Hundreds of people have been sentenced to death in a crackdown on the Brotherhood following the removal of President Mohamed Morsi in 2013. However, so far only one death sentence has been carried out. The court session was broadcast live on TV. The sentences are the final phase in the trial which saw Muslim Brotherhood leaders charged with encouraging members of the group to confront the state and spread chaos following the dispersal of protests in 2013. They were handed down following advice from Egypt’s highest Islamic legal official, the grand mufti. Two of the defendants were sentenced to death in absentia. Mohamed Badie was already sentenced to death in a case last year related to attacks on police stations in the southern province of Minya. But the ruling was later overturned and a retrial was ordered. US-Egyptian citizen Mohamed Soltan was sentenced to life imprisonment for supporting the Brotherhood and transmitting false news. The son of Brotherhood preacher Salah Soltan, he has been on hunger strike for months and has received attention from local and international human rights organizations. Critics describe the trials against Brotherhood members as politicized, but the government insists on the transparency and independence of the judiciary.